Jupiter and the other planets farthest from the sun are called the outer planets. The first four outer planets—Jupiter, Saturn, Uranus, and Neptune—are much larger and more massive than Earth, and they do not have solid surfaces. Because these four planets are all so large, they are often called the gas giants.Figure 17 provides information about these planets. It also includes Pluto, which is now classified as a dwarf planet. Like the sun, the gas giants are composed mainly of hydrogen and helium. Because they are so massive, the gas giants exert a much stronger gravitational force than the terrestrial planets. Gravity keeps the giant planets’ gases from escaping, so they have thick atmospheres. Despite the name “gas giant,” much of the hydrogen and helium is actually in liquid form because of the enormous pressure inside the planets. The outer layers of the gas giants are extremely cold because of their great distance from the sun. Temperatures increase greatly within the planets. All the gas giants have many moons. In addition, each of the gas giants is surrounded by a set of rings. A ring is a thin disk of small particles of ice and rock. 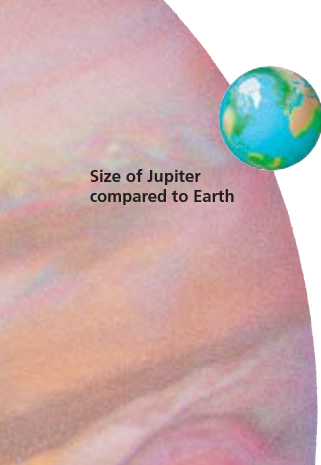 Jupiter is the largest and most massive planet. Jupiter’s enormous mass dwarfs the other planets. In fact, its mass is about 2½ times that of all the other planets combined! Astronomers think that Jupiter, like the other giant planets, probably has a dense core of rock and iron at its center. 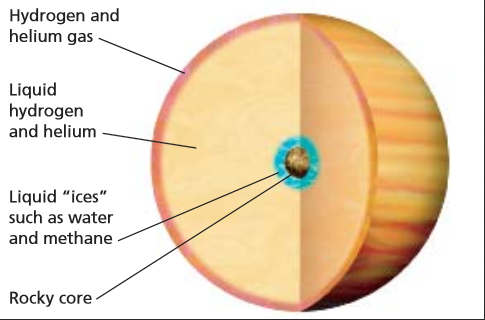 As shown in Figure 18, a thick mantle of liquid hydrogen and helium surrounds this core. Because of the crushing weight of Jupiter’s atmosphere, the pressure at Jupiter’s core is estimated to be about 30 million times greater than the pressure at Earth’s surface. Jupiter’s MoonsRecall that Galileo discovered Jupiter’s four largest moons. These moons, which are highlighted in Figure 19, are named Io (eye oh), Europa, Ganymede, and Callisto. All four are larger than Earth’s own moon. However, they are very different from one another. Since Galileo’s time, astronomers have discovered dozens of additional moons orbiting Jupiter. Many of these are small moons that have been found in the last few years thanks to improved technology. The second-largest planet in the solar system is Saturn. The Voyager probes showed that Saturn, like Jupiter, has a thick atmosphere made up mainly of hydrogen and helium. Saturn’s atmosphere also contains clouds and storms, but they are less dramatic than those on Jupiter. Saturn is the only planet whose average density is less than that of water. Although the gas giant Uranus (yoor uh nus) is about four times the diameter of Earth, it is still much smaller than Jupiter and Saturn. Uranus is twice as far from the sun as Saturn, so it is much colder. Uranus looks blue-green because of traces of methane in its atmosphere. Like the other gas giants, Uranus is surrounded by a group of thin, flat rings, although they are much darker than Saturn’s rings. Discovery of UranusIn 1781, Uranus became the first new planet discovered since ancient times. Astronomer William Herschel, in England, found a fuzzy object in the sky that did not look like a star. At first he thought it might be a comet, but it soon proved to be a planet beyond Saturn. The discovery made Herschel famous and started an era of active solar system study. Exploring UranusAbout 200 years after Herschel’s discovery, Voyager 2 arrived at Uranus and sent back close-up views of that planet. Images from Voyager 2 show only a few clouds on Uranus’s surface. But even these few clouds allowed astronomers to calculate that Uranus rotates in about 17 hours. Uranus’s axis of rotation is tilted at an angle of about 90 degrees from the vertical. Viewed from Earth, Uranus is rotating from top to bottom instead of from side to side, the way most of the other planets do. Uranus’s rings and moons rotate around this tilted axis. Astronomers think that billions of years ago Uranus was hit by an object that knocked it on its side. Photographs from Voyager 2 show that Uranus’s five largest moons have icy, cratered surfaces. The craters show that rocks from space have hit the moons. Uranus’s moons also have lava flows on their surfaces, suggesting that material has erupted from inside each moon. Voyager 2 images revealed 10 moons that had never been seen before. Recently, astronomers discovered several more moons, for a total of at least 25.